From September 1-6, FAME will exhibit at the IFA in Berlin. Visit us at the ZVEI Deutsche TV Plattform booth in hall 26A (IFA NEXT), no. 219a/219b and at the rbb booth in hall 2.2 (ARD-Halle). The Interactive 360° Streaming Suite makes elements of 360° videos clickable and thus allows an interactive experience for the viewer. While the Cloud-based 360° Video Playout offers the optimal streaming solution by significantly reducing the required bitrate, the Interactive 360° Streaming Suite adds the storytelling feature to 360° videos. The Interactive 360° Streaming Suite offers many options to the content creator to make an individual viewing experience possible and can be used on desktop as well as on mobile devices. It consists of a web based editor as well as cross-platform players (HbbTV, Web, mobile devices, HDMI sticks, etc.). The tool provides various pre-defined markers as well as customizable icons to tag different elements of the video to make them interactive. Markers can be sticked on static and moving elements in the video or on a fixed screen position. Interaction elements allow for the dynamic display of overlays and supplementary information as well as to link to other video segments and resources. The Interactive 360° Streaming Suite will be presented at the stand of ZVEI Deutsche TV Plattform at IFA Berlin. 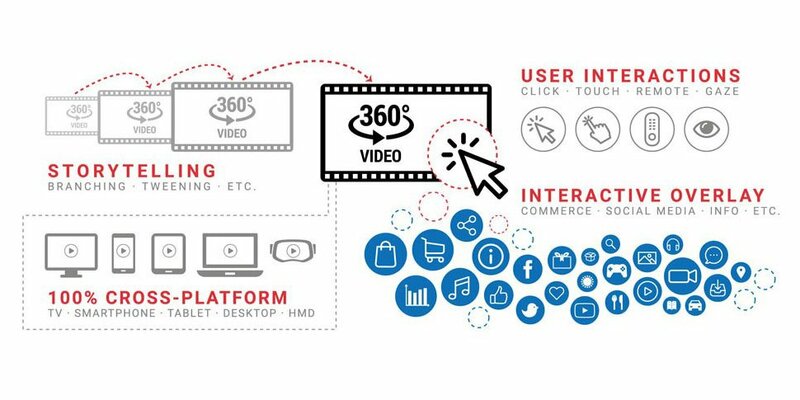 The Cloud-based 360° Video Playout allows the viewing of high quality 360° videos on devices with constrained capabilities such as TV sets and HDMI stick devices. Usually the delivery of such video material consumes a large bitrate and results in a considerable processing load to perform the geometrical view projection and rendering. For example in order to achive a 4K FoV resolution, bit-rates of 200 – 300 Mbit/s is required to stream the complete 24K 360° video and it requires a few seconds to render the 4K FoV frame from the 24K equirectangular frames – which makes a smooth playback impossible even on modern devices with high processing and graphical computing capabilities. Field of View Adaptive Streaming addresses both aspects and reduces the required bit-rates and processing resources by rendering the field of view in the cloud in advance and by streaming only the selected field of view to the client. By doing so, many features which are applicable to classical videos can be also applied to the FOV videos for example: adaptive streaming using DASH and MSE, efficient delivery over existing CDNs and DRM Support over EME, and even Live Streaming scenarios. The solution also supports synchronization across multiple TVs and other devices (even mixed) so that a shared as well as an extended experience is possible. The Cloud-based 360° Video Playout will be part of the presentations at the stand of ZVEI Deutsche TV Plattform at IFA Berlin. MPAT is an editor and CMS for the production of HbbTV applications, which allows content creators without specific technical skills to build interactive TV applications. It is based on the HbbTV Application Toolkit (HAT) and further developed in an EU funded project, coordinated by the Fraunhofer FOKUS’ Competence Center FAME and rbb (Germany) and Mediaset (Italy) as broadcast partners. MPAT is based on the popular WordPress platform and adds HbbTV capabilities by means of themes and plug-ins. It offers the content creator three different navigation models, including the Slideflow navigation and a set of additional features. MPAT is available as a cloud service instance for immediate use and full scalability, covering the full range from small tests to multi-million viewership. Alternatively, it can also be installed by broadcasters on their local servers. The German broadcaster rbb (Rundfunk Berlin Brandenburg) used MPAT to build the HbbTV applications supporting the “Band Camp Berlin” series, the 25th anniversary edition of “Brandenburg Aktuell” and the “Täter, Opfer, Polizei” real-life crime series, which will premiere as a regular companion to the TV series at IFA 2017. Additionally, Mediaset used MPAT to explore the applicability for interactive advertisement and to show the suitability to create multiple apps applicable to different contexts and targeting different communication needs. At IFA Berlin we will present the MPAT editor and demonstrate the pilot apps of rbb under the conditions of day-to-day broadcast production.